Amarone, from the root amore: to love … and for many an Amarone fan it was love at first sip. Whether that is the true etymology of Amarone, I can only surmise, but once you’ve tried one of these highly prized wines you never forget it. What do you need to know about Amarone that hasn’t already been said to you by a friend, a loved one, or anyone else you know who drinks Italian wine? It’s the granddaddy of Italian wine, the one that everyone loves and even if you’ve never tasted one you’ve most definitely heard of it. The first misnomer we should dispel is that Amarone is a grape (it’s not, and neither is Valpolicella) — it’s a style and a region within Veneto — the wine is made from a blend of grapes starting with Corvina and Rondinella. The second thing you need to know is the style uses what’s known as the appassimento method — that of drying grapes for anywhere from 60 to 120 days in special drying rooms — where the grapes can lose up to 30 per cent of their water weight, before being pressed. This makes for a wine more robust in alcohol that seems almost unctuously sweet, when in fact it’s dry. Third, Amarone is a wine with great aging potential, and it’s almost a crime to drink it young, or without decanting, as it needs time in bottle to amalgamate all those flavours — that’s one of the reasons why producers hold the wine for a minimum of three years before releasing. 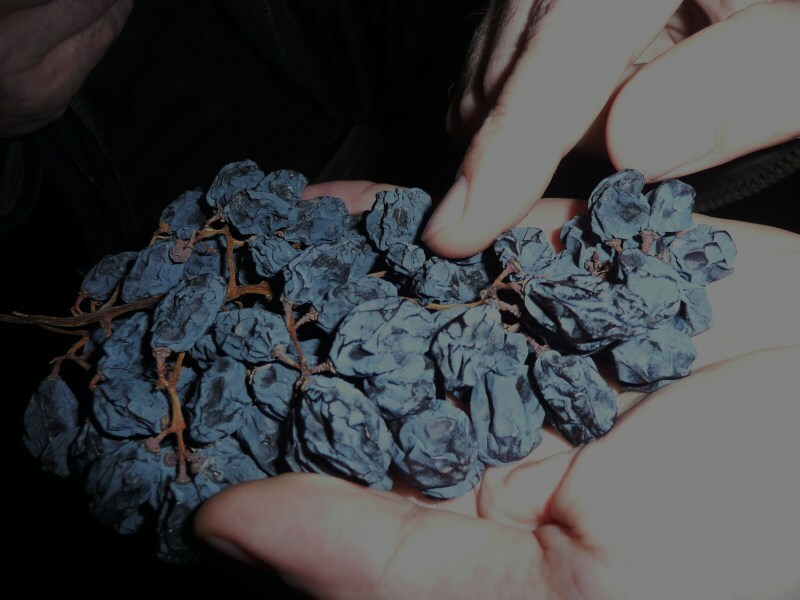 An offshoot of Amarone is Ripasso, a method used where Valpolicella wine is re-passed or re-fermented using the leftover skins from the making of Amarone. This creates a wine of better concentration and depth with more robust flavours then simple Valpolicella. This new classic method (invented by Masi in 1964) has also made its way over the pond to our shores, where a few wineries are attempting to use Old World know-how in a New World way. While a winery like Foreign Affair is drying its grapes the old fashioned way, Colaneri, Burning Kiln, Reif and a few others are drying the grapes in a fraction of the time it takes their Old World cousins using out of commission tobacco kilns. What takes the Italians up to 120 days can take as little as a week to 10 days in a kiln. And, in case your friends ask, Amarone literally means “the great bitter” … I liked my definition better. Back in 2007 The Foreign Affair released its first and only Conspiracy — an appassimento-style wine: they re-poured or re-passed the wine over Amarone-style wine skins, creating what the wineries in Veneto call Ripasso (Ripassa). The results are a fleshy fruity wine with the holding power of close to a decade. Lots of red and black fruit lead the charge on this nose here with hints of chocolate. This follows onto the palate with plenty of ripe fruit. This one’s very approachable and easy drinking now, but will be even better in 2 to 3 years and a real winner in 5 to 7. This wine is a total delight by one of NOTL’s newest wineries. It’s done in the Ripasso style. It really brings out the fruit in this wine with lovely cherry and raspberry complimented by sweet vanilla notes; it’s ripe, ready and sippable now, but should benefit from another 5 years of aging with no problem. Winemaker Andrzej Lipinski dries a portion of the grapes in tobacco kilns to extract more flavours and ditch some of the excess water (think of it as the appassimento or Amarone-way that the Italians use, just sped up). What he’s come up with is a way to show true flavours even in less than favourable vintages. 50% of these Syrah grapes saw the inside of the drying kiln and managed to maintain real Syrah character. A nose of smoked meat, pepper and raspberry leading to flavours that follow along the same lines yet seem light on the palate. Great finish with well maintained acidity along with white pepper and ramped up spiciness. The third time the folks at Reif have made this seemingly strange bedfellow blend of Pinot Noir and Shiraz, but surprisingly it works. A 60/40 blend in favour of the Pinot, where a portion of each variety is dried in kiln — 30 % of the Shiraz and 20% of the Pinot. The result is a wine loaded with dried cherry notes along with hints of earthiness and a supple finish. This is 100% Cabernet Franc but only 60% is dried; the other 40% is what the winemaker calls “fresh fruit.” Plum and cherry with hints of spice and pepper with quite a nice bite on the finish, though across the tongue it’s smooth and supple. This is a fully appassimento-style wine, but instead of 120 days of drying, the grapes get 5 weeks in their special room. 83% Cabernet Sauvingon (dried) with 17% Cabernet Franc (not dried) — nice cherry and spice notes with hints of blackberry and vanilla. This needs a few years to mellow, or you can decant it, because it’s a little rough around the edges if opened right now. A double dose of wow in this bottle from the granddaddy of Ripasso, and this is one with an Argentine twist. Corvina (Italian) and Malbec (Argentina) are the dried grapes used, both grown in Argentina. The result is a spicy, dark fruited number that is cellar-worthy for 7-plus years. This is Masi’s “flagship” wine and in 2008 they’ve outdone themselves, but at a cost to those who love their single vineyard offering. According to Masi, 2008 was not a great vintage, so their exceptional single vineyard Amarones were not made, instead they were declassified and the grapes make an appearance here. Lovely plum, cherry, chocolate with spice and anise notes — elegant and delicious. A very rustic Amarone that needs time to find its fruit. Leather and tea notes envelope coffee and herbs, decant if drinking now or wait another 5-plus years before even considering drinking. When you can’t wait the prerequisite 8 to 10 years a half-bottle is the way to cut that time a little (as big bottles age slower). Mocha, blackberry, tobacco and blackcurrants all make an appearance here. This Alighieri gets aged 4 to 6 months in cherry wood, which seems to give it a little more lift in the fruit department: plum, red berries, chocolate, tea leaf, coffee, spice — it’s all here and all so well integrated. The nose has interesting herbal, redcurrant, and balsamic soaked raspberries, while the palate is soft and approachable with hints of white pepper and spiced red cherries. A real hedonistic pleasure of a wine. Aromas that lure one into the glass: red fruited with cherry and raspberry wafts up into the nose, reminiscent of the Douro Valley reds, with some plum and chocolate to back it up. The palate delivers on the promise of the nose with full-on red fruit, cherry compote and spice cake, super sweet and super lush, smooth and supple. The fruit here doesn’t exactly pounce out of the glass, it’s more like it drifts: herbal blackberries, with a whiff of chocolate, hint of plum and cherry cola — very pretty. Subtlety continues with lots of ripe red fruit, chocolate cherries and vanilla, along with a nice acid/tannin balance. This wine shows some finesse and elegance and should be one to hold for the long haul. This is a surprising Amarone that at first sniff might not be everyone’s cup of tea: earthy, barnyard-ish aromas that you would swear was Pinot if not for the high alcohol … but the palate wins you over with earthy, minerally notes, with nice balance of blackberry and spiced black cherry, and a great lingering mouthfeel; there’s even some chocolate in here giving the wine a certain balance and pleasantness to the finish. Starts off very closed with herbal and balsamic notes that seem to carry little to no fruit. What you get on the nose you’ll find on the palate though it’s very smooth and easy with a little bite on the finish — this one should evolve nicely over the next decade. This wine mixes the best of both worlds that people love about Amarone: balsamic and black cherry, along with cocoa and vanilla — palate does not disappoint as all those aromas come racing into the mouth pleasantly and with such a nice balance, nothing overwhelms or overpowers; elegant with some black pepper on the finish.